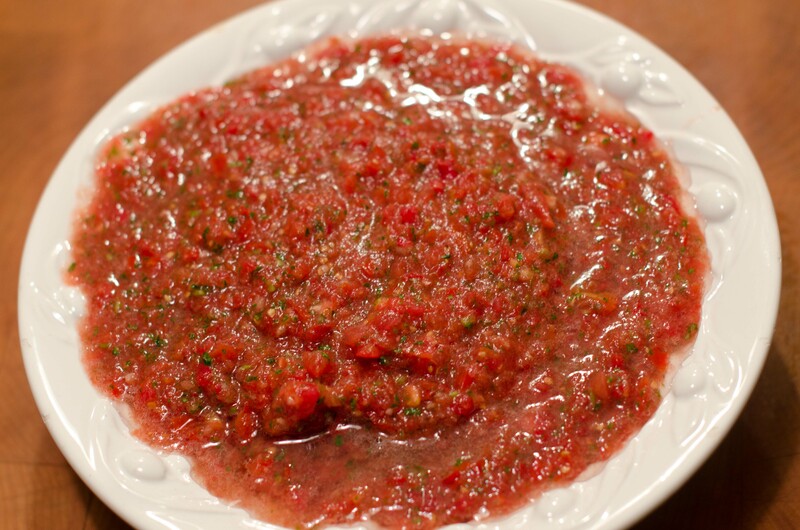 I’m a big fan of fresh salsa and while there are some delicious ones you can buy, you will pay for it. At the rate I go through this stuff it only makese since to make it myself. And as with all home cooking, you get the benefit of complete ingredient control! It also doesn’t hurt that I pulled the majority of the ingredients straight out of my greenhouse. Before I go any further I should say every element of this recipe can vary. Don’t have garlic on hand? Use a dash of garlic powder. Prefer an extra kick? Add another jalapeno, ect. I have made this recipe many different ways and haven’t found one I don’t like. Put cilantro, onion(roughly chopped), garlic, and jalapeno into food processor and use the pulse setting to chop. Note: If you don’t have a food processor, just finely chop these everything by hand. Even though this takes longer, sometimes I prefer this method because you end up with a much more chunky salsa. Take each tomato and juice it by squeezing it over a bowl. Set juice aside. While this step may not seem necessary, I find the salsa to have too much liquid if I don’t. I tend to put this juice into the fridge or freezer and save for sneaking into smoothies for my kids. If using a food processor, add tomatoes, lime and salt and pulse until you get the desired consistency. If you are chopping by hand just chop finely and add them (as well as lime and salt) to the rest of the ingredients. Note: Normal people might think this makes a lot of salsa. It’s a good amount to serve at a party as an appetizer or to be able to freeze some for later. For people like me.. I will be lucky if this lasts through tomorrow! We’re linked up on The Nourishing Gourmet and This Chick Cooks.